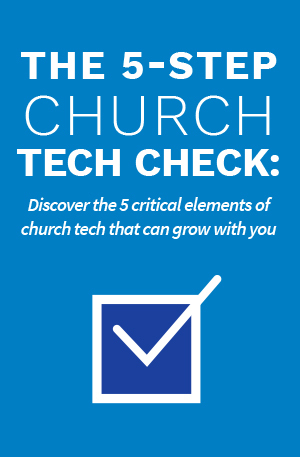 Discover the 5 features in church tech that will propel your ministry forward and help fulfill your mission. If your church is like most, then you probably didn’t get an advanced degree in computer sciences before heading into ministry. You’re in the business of ministry work, missions and community impact—not the business of business. And certainly not the business of managing APIs, encryptions and all the crazy technicalities of creating good technology. But not caring about the technology you use in pursuit of your mission is dangerous. In fact, your community is online (yes, even Gladys who just turned 99 has the Facebook app on her phone). And not having a strong digital presence means failing to meet Gladys where she’s at. That’s why excellence in church technology matters. Not because you need some fancy, new piece of shiny technology, but because it’s the way people communicate now. With great church tech, you’re better able to engage the people in your community and fulfill your mission more effectively. Additionally, excellent tech often takes inefficiencies out of admin processes, saving staff time that can then be reinvested in ministry projects. Excellence in church tech means more people are reached and lives are changed through your ministry. But figuring out what technology can actually help you is difficult. That’s why we created the free ebook, 5 Key Elements of Excellence in Church Technology. It’s a distillation of best practices and wisdom from thousands of churches in every situation imaginable. And it’s everything you need to identify what technology you need (and what technology you need to get rid of).